I’ve been in Europe since early August as a Fulbright Scholar. Most of that time has been in the beautiful city of Graz, which is in southeast Austria. I am teaching a course at the Jazz Institute at the Kunstuniversität Graz (Graz University of the Arts). As part of this work, I was invited by a former Fulbright recipient, Professor Elisabeth Strempfl, to give a presentation at the Dreihacken Musik Gymnasium, which is a high school that has a strong focus on music instruction. I’ve given these types of presentations many times, but I was looking forward to hearing the questions from this group of young Austrian music students. The truth is that no one can answer those questions authoritatively, but it did get me thinking about career strategies as the second decade of the digital online revolution. In earlier posts, I suggested that musicians need to adapt to this new environment and develop new strategies for the era in which we live. Are any of those strategies emerging? 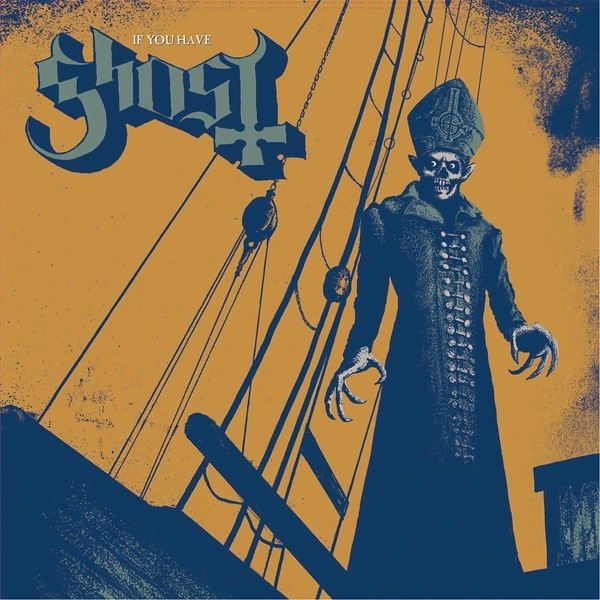 I’ve been following the band Ghost B.C. since I saw them last May in Detroit. (I blogged about the concert here.) As you can read in my previous blog, I was somewhat confused by the group. Did a coven of Satanists really get together to form a band? That didn’t seem likely, so I started to research the members of the group as best I could, which was not easy given that they never appear without their horrific stage regalia which completely hides their identity. Still, the internet rumors regarding the group members identity pointed to two defunct Swedish groups, Subvision and Magna Carta Cartel. Here’s the first track, Room 611, from Subvision’s full length album entitled So Far, So Noir. Subvision formed in 2002 in Stockholm and released So Far, So Noir in 2006 along with one EP (The Killing Floor) two years earlier in 2004. The founding members of the group include Tobias Forge (guitar and vocals), Gustav Lindström (bass) and Thomas Daun (drums). They eventually added a second guitarist, Martin Persner, in 2005 and the group’s identity became clear as a guitar-oriented pop/rock band. Subvision is a great pop band—the writing, playing and the arrangements are all incredibly infectious and well-crafted, as opposed to their disappointing initial EP release. Echoes of 60s, 70s, and 80s pop music are found throughout, although there is a playful, if sometimes sinister, punk attitude that permeates the album. The songs are perfect and punchy little gems that are primed and ready for radio play and heavy rotation—catchy, lean, and super addictive—but they never had much success outside of their native Sweden. And the writing is quirky and clever—listen to a delightfully absurd quote of the melody from the Theme from the Godfather as it briefly and inexplicably appears at 1:35 in Beyond the Moon. “Secular Haze”? 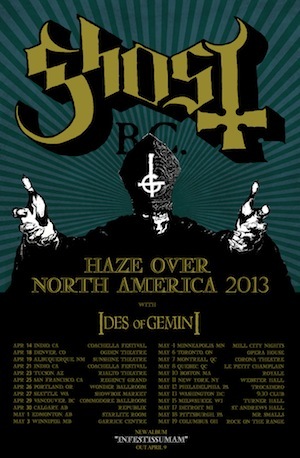 Ghost’s 2013 US Tour was entitled “Haze Over North America” and they indeed have a tune entitled Secular Haze. Hard to imagine that the use of this obscure phrase is purely coincidental. When I first heard the group, I immediately thought that they were living in the wrong era. Most pop groups find their sound and their niche, and then they milk it until the cow falls dead from dehydration. Subvision, however, produced high quality songs that showed significant growth and maturation since their founding in 2002. This is not a common phenomenon in the pop music industry. In any case, very few demonstrate musical growth and significant changes in style over time. Had Subvision existed prior to the digital era, I thought that they would have had been a shoe-in for a major label contract, and given proper development funding, they could have become big stars, all based on their ability to actually write great tunes. Then, the group morphs into something very different, something they called Magna Carta Cartel. Here we find a turn towards more artsy rock with a nod towards post-minimalism, and lyrics inspired (it seems) by E.E. Cummings. The writing is similarly strong and again, all elements point to the same singular person or persons at the helm of this group as well. I have no idea if that happened, but if I was a member of these groups, that’s the question I would have been asking. These are both outstanding groups that produced high quality pop music (in very different genres) and neither could break through to find international success and attention. So, what the hell else are they supposed to do? Apparently, they actually go to Hell and come back transformed as the Nameless Ghouls with their fearsome leader, Papa Emeritus, the devil’s Pope. In other words, they added a significant theatrical component to what is, essentially the same music they have been writing for the last decade or more, and they change the lyrics from lost love and sick-amore, to ghouls, zombies, and Lucifer’s Son. What happens next is amazing—they become an international success, filling up major and minor venues across the US and Europe with ease, and outside of the theatrics and the lyrics, they really aren’t doing anything drastically different (musically speaking) from what they had been doing in their previous incarnations. As I considered this phenomenon, I started to think that what they’ve done is unusual in pop music, but it’s not that unusual in classical music or theatre. Actors and opera singers (and musicians to lesser degree) regularly take on new roles and new characters as part of their normal work as artists, and that includes changes of style and even genre. This is fairly easy for highly trained musicians and singers to do, but many pop musicians simply don’t have the technical skills to deftly move between genres with assuredness, so it is not a model that could be easily mimicked by other groups. These musicians from Sweden are of a different ilk entirely, more in line with the technically proficient progressive rock groups that they emulate, like King Crimson, Genesis, and others. Is that then what the creative mind(s) behind Ghost (aka Subvision and Magna Carta Cartel) has/have done to find success in the modern era? It appears to me that this is exactly what they have done, and their success continues unabated with the release of an EP entitled If You Have Ghost which was produced by none other than legendary musician/rock impresario David Grohl (who also contributed as a drummer) and actually made it to the top 100 in the US. This EP, however, is mostly full cover tunes, and the satanic connection is, therefore, much weaker than in their own music. The theatrical and lyrical content is quite provocative and extreme, and for that reason, one wonders how long it can be sustained. Or perhaps, according to their modus operandi, it need not be sustained much longer at all; the Ghosts could easily disappear and reinvent themselves in some other genre…Christian Rock perhaps? Now that would be devilish! * With special thanks to Kaarin Anderson-Ryan for Swedish translation. Also available online at the Huffington Post. Great quote, and so true. Nice article. I love the music of all three bands. As long as they make music together I will be happy!